Proocam Pro-J092 Mount for Helmet,360-degree roration with lock is not just for helmets, but allows mounting of your action camera to a variety of smooth, rounded surfaces. 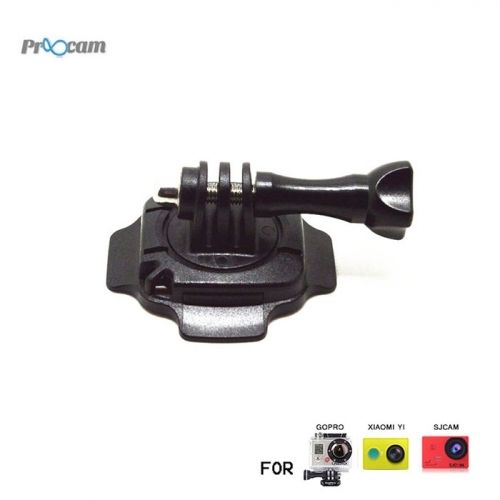 The mount uses the standard three-prong interface that couples with all GoPro original housings and frames, and works with many third-party mounting accessories that adhere to the GoPro standard as well. This interface enables 360-degrees of camera rotation, and allows the camera to tilt - ensuring you achieve the optimal camera angle, even when mounting on a slanted surface. The adhesive pad this uses forms a semi-permanent attachment that can be removed later on with a hair dryer.